Review: Beryl at Nottingham Playhouse. – East Midlands Theatre. Review: Beryl at Nottingham Playhouse. Beryl is a West Yorkshire Playhouse production on tour directed by Rebecca Gatward. Due to several elements it is a charming, emotional, funny and gritty hit at Nottingham Playhouse. It is only on for two nights at this venue then off it spins to Doncaster Cast and Birmingham Repertory. Like the cyclists’ snatched drinks during a gruelling race it is a case of catch it while you can. Four actors tell the tale of the almost forgotten champion female cyclist Beryl Burton on the open set designed by Naomi Dawson. The bike workshop set is perfectly suited to breaking the fourth wall and creating an immediate connection with the audience which it does with bells on. Within five minutes of the story unfolding the audience are one with the cast and willing the determined and plucky Beryl to sporting success. The humour is as dry as Yorkshire grit stone and Maxine Peake’s engaging play makes the audience laugh one second and find the tears brimming in their eyes the next. These aren’t necessarily all tears of sadness but aligned to some expression of pride and wonder at Beryl Burton’s huge success in the world of cycling. Success that until recently has seemingly been forgotten by history. As we are often reminded, this play takes place during a period in time (1960s and 1970s) when there was no prize money incentive just the pride of winning for your team or country and personal pride. Ironically Beryl Burton was more feted as a cycling sportswoman on mainland Europe than she was in her own country. Beryl (Samantha Power) is portrayed as a very down to earth woman and a mixture of hard working ‘don’t make a fuss of me’ driven ambition borne of being told she would amount to nothing by doctors as a child. She was an incredible woman and her many cycling trophies attest to her strengths and passions in the sport. As well as other roles Power puts in a smouldering and wry powerhouse of a performance as Beryl. All four hard working actors play a variety of smaller roles as well main characters like Beryl’s supportive husband Charlie Burton (Lee Toomes). Rebecca Ryan portrays Beryl as a girl as well as Beryl’s daughter Denise and her impersonation of ‘a bloke’ has the house weeping with laughter! Matthew Ganley is strong as Nim and hilarious as the air hostess. All act as narrators telling the story often whilst riding a racing cycle and presenting a scene through simple props. 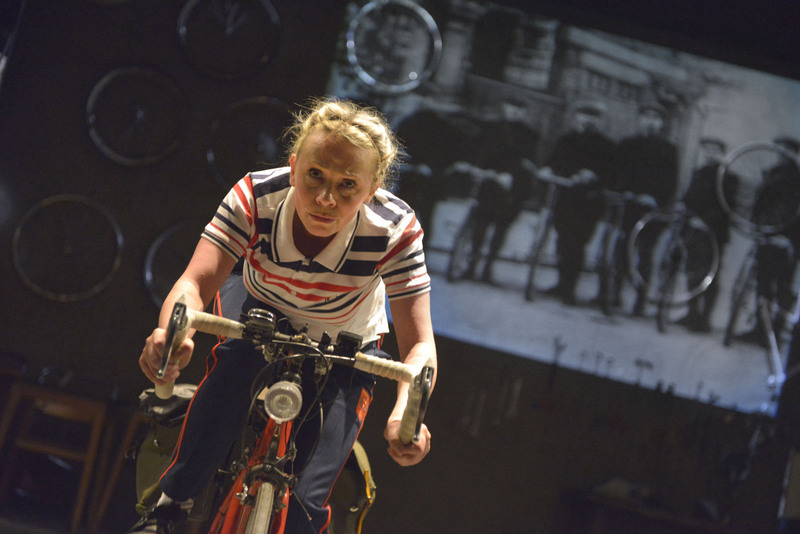 This is a very physical show and it is done with considerable energy and obvious love for telling this important story of a remarkable Yorkshirewoman whose cycling achievements still set the benchmark for professional cyclists today.